A Devon bypass first proposed more than 50 years ago is expected to get the go-ahead as part of a £30bn national investment plan by the government. 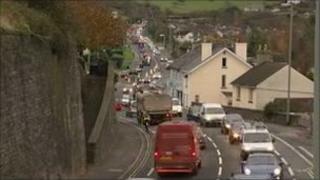 The Kingskerswell bypass would link Torbay and Newton Abbot and cost £110m. In September plans were submitted to the Department for Transport in a bid to secure £76.3m of funding. Chancellor George Osborne is expected to announce support for the bypass on Tuesday as part of his Autumn Statement. Opponents to the bypass have claimed it would damage the village of Kingskerswell by stopping traffic travelling through it and disrupt the ecology of the surrounding countryside. Liberal Democrat MP for Torbay, Adrian Sanders, said: "Areas that have good transport links have stronger economies... we're only trying to catch up with the rest of the country." Devon County Council and Torbay Council said they would contribute £33m, while Teignbridge District Council said it would pay up to £500,000 towards the bypass. Earlier in the year, Devon County Council said if the bid was successful work could start in autumn 2012, with the bypass open by the end of 2015. Various road schemes and rail projects across Britain are thought to be among 40 projects earmarked for help. The government says the initiative, called the National Infrastructure Plan, would see it and private investors support both social and economic schemes over the coming decade. The 40 highlighted projects for support from the plan include the Transpennine Express line between Leeds and Manchester, the Metro system in Tyne and Wear as well as improvements to the M25, M3 and M56.